Today in Masonic History Giacomo Girolamo Casanova is born in 1725. Giacomo Girolamo Casanova was an Italian adventurer and writer. Casanova was born on April 2nd 1725 in Venice, Italy. Venice at the time of Casanova's birth was a city that was on the "must" list for any young European man on his Grand Tour, a tradition of traveling around Europe. It is probably the environment of Venice that helped to form who Casanova would later become. By his own description Casanova's parents were disinterested in him. He was largely raised by his grandmother before being sent away to a boarding school. In his memoirs he wrote of his being shipped off to boarding schools as "So they got rid of me." It was at boarding school that he taken in by a priest and his family. The priest taught at the boarding school. It was in the priest's home that Casanova would have his first sexual experience at the age of 11 with the priest's younger sister, who was still much older than Casanova. In 1742, Casanova graduated from the University of Padua with a law degree, which Casanova hated but would utilize it through much of his life. Casanova traveled back and forth between Padua and Venice. On a chance encounter, Casanova saved the life of a senator, who would later become his patron. When the senator was felled in a gondola, which he was sharing with Casanova and some other men, with a stroke, Casanova leapt into action. He watched as a physician who was summoned failed to help, pushing the physician aside, Casanova went to work on senator and was able to revive him when the physician had said that he was surely going to die. The senator who believed that Casanova possessed an occult knowledge wanted him close. Casanova would actually say that he wished that he had been allowed to become a doctor instead of a lawyer stating "I should have been allowed to do as I wished and become a physician, in which profession profession quackery is even more effective than it is in legal practice." Casanova who was barely out of teens already found himself in trouble due to his sexual appetites. He would already be kicked out of one patrons home for having a sexual relationship with a young woman who his patron already had his eye on. Before long he would leave Venice and head to France, before traveling all over Europe. Casanova would begin gambling heavily and would find himself on several occasions thrown in jail for his debts or forced to flee the country he was in. A similar situation occurred on his first trip to Paris. Casanova essentially slept his way into Paris and drew the attention of Paris police. By the age of 30, Casanova was back in Venice. This time the local authorities in Venice would not allow him to get away with his behavior. He was arrested and place in a high security jail that was reserved for political and high profile prisoners. At first in solitary confinement he would eventually be allowed to take walks around the grounds. As the story goes, told in writing a couple of times by Casanova, he found a metal bar and a stone with which to sharpen the bar. He then used it in two escape attempts. The first was in his original cell where he had began cutting through the floor with the bar. Before he could use the hole to escape, he was moved and then he and a renegade priest would use the bar to escape. Some scholars are skeptical of this story, while others claim that there is some historical evidence to at least imply the story is true. No matter how Casanova got out of the cell he would end up spending the next two decades in exile from Venice. During his exile, Casanova would travel again around Europe, starting in Paris. There he became the head of the state lottery, an idea he had come up with. Casanova made a fortune, unfortunately he very quickly lost the fortune as well. 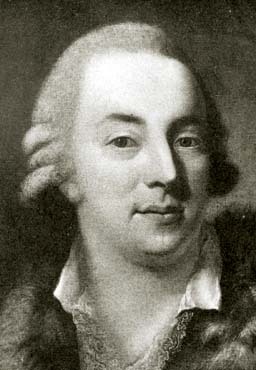 Casanova began traveling around trying to convince other countries to utilize his state lottery ideas. He found no takers, although his travels allowed him to further his sexual escapades. Eventually he traveled to Rome and sought permission to return to Venice. Eventually he was given permissions and he returned to his home. Again though it was short lived, and once again Casanova was back on the road. In 1783, Casanova met Benjamin Franklin in Paris. Franklin was not the only prominent man and mason that he would meet in his second round of travels. He would also meet Voltaire who he would eventually get into a philosophical battle with. He would also meet Mozart. At the time Casanova met Mozart, Mozart was composing his opera Don Giovanni, which was essentially like holding up a mirror to Casanova's life. It is unknown how Casanova reacted to seeing what was essentially his life being shown as immoral, it is claimed that Casanova wrote lines for Don Giovanni but they were not used. Casanova spent his remaining days in Bohemia, a shell of the out going man he once was. In 1797, he received word that the state of Venice no longer existed after Napoleon had taken it over. Casanova passed away on June 4th, 1798. Casanova passed away on June 4th, 1798. Casanova joined Freemasonry on his first trip to Paris. He was fascinated by the rituals of the fraternity. He would use his masonic connections over and over again as he traveled around Europe and tried to ingratiate himself to the local nobility. Casanova was a member of Lodge of the Duke of Clermont.